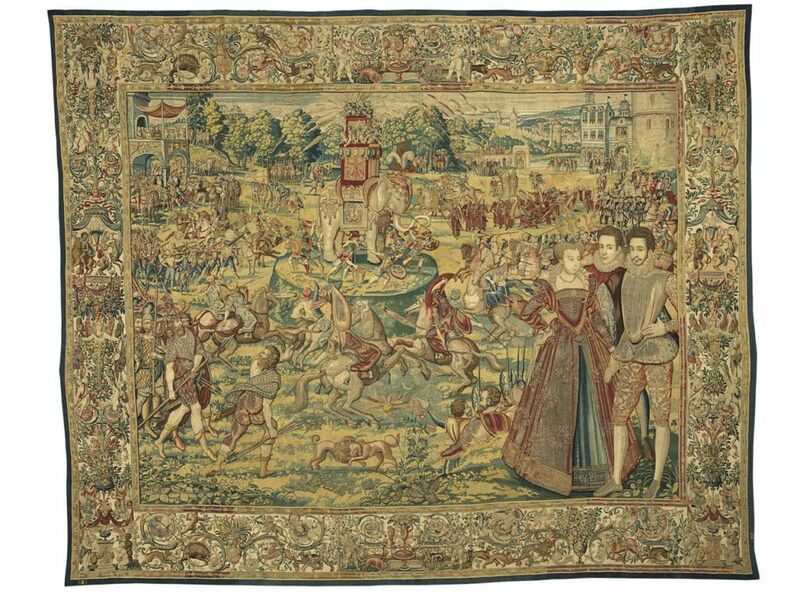 They are the Valois tapestries, commissioned by Catherine de’ Medici after her husband, Francois I, died and left her queen mother and regent (for a while). 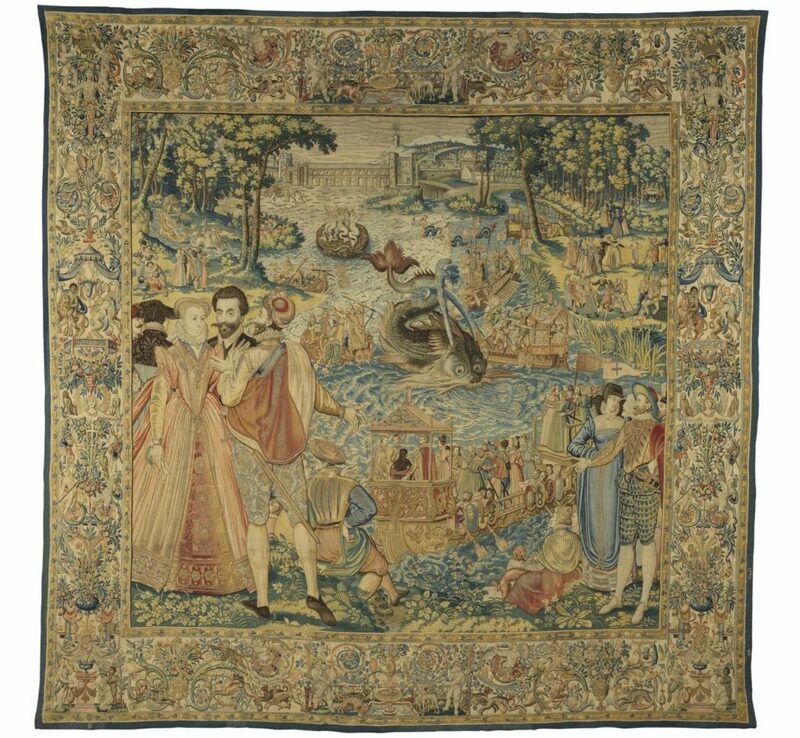 Catherine, of course, knew how to use art to project power–and the weavings commemorate the court festivals she staged to project the power of France’s ruling family. Over the years, they had faded, been damaged by bugs, and tarnished–they’re laden with gold and silver threads–by time. But in recent years, the American-based Friends of the Uffizi Gallery (sister to the Italian organization) stepped in to fund the conservation of the tapestries. When they (well, six of eight) were ready to be shown, Cleveland director William Griswold asked Uffizi director Eike Schmidt for them, and he got them. 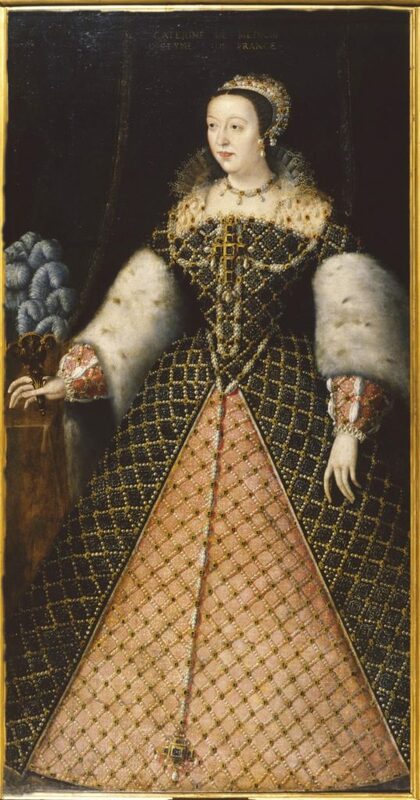 The Cleveland museum gathered related art works–such as hard-stone objects collected by Catherine and portraits of her, her son Henri II, and other paintings–and mounted an exhibition called Renaissance Splendor: Catherine de’ Medici’s Valois Tapestries. In each one, life-size kings, princes, princesses and courtiers occupy a corner of the foreground. Based on drawings by court portraitist François Clouet and artists in his circle, many of these characters make eye contact with the viewer. It’s as if they are inviting visitors into the grand scenes taking place behind them, which use drawings by Antoine Caron and written records of the “magnificences” as inspiration. So…In “Whale,” a marvelous mechanical sea monster, with unlikely spouts, a pug nose and whiskers more suited to a catfish, noses up to a barge where a tiny Catherine, dressed in black widow’s garb, is watching the show. And in “Elephant,” soldiers secure the mechanical animal, festooned with feathers, which carries a crowd of clamoring soldiers at war with a group below…. I’ll post a two of them here (from the CMA)–“Whale” and “Elephant” and hope you will see the show if you can.